When I was fifteen years old I began taking driving lessons. For those of you out there keeping score, I am thirty-one and still not legally allowed to drive a car….yeah, I get distracted often. ANYWAY – my driving instructor was a very patient young fellow, with whom I tended to rant about sundry subjects. It was a very pleasant way to spend a Saturday afternoon, as he cleverly noticed that I became less tense when chatting away and encouraged my little flights of digressive fancy while speeding through suburban Dublin. One day he handed me a copy of Khalil Gibran‘s The Prophet. It inspired in me an interest in philosophy, which I later chose to study in college. Here’s the thing though – before today I had no memory of the book itself. For it to have presumably made enough of an impact on me that I decided – ‘yes, repetitive beard stroking while talking about Life is what I hope to do for the rest of mine’ – and yet nothing of Gibran’s writing has stayed with me struck me as extremely curious. So when I saw a copy of the book today I decided to revisit it. The titular prophet is Almustafa, a teacher in a foreign land who has spent years in the city of Orphalese and is shortly about to sail home. Before he leaves, the people of Orphalese led by a priestess named Almitra requests that he give them one last sermon. He agrees and commences answering questions on various topics such as marriage, death, work, the act of giving, in the form of rhetorical parables. The style of the book is a form of ongoing free verse, which lends itself to Gibran incessant use of metaphors and riddles. It certainly is a pleasant read, but Almustafa comes across as needlessly obtuse at times and then overly fond of truisms at others. ‘Love should not be possessive’, is certainly not a revelation, but it is phrased in such a way to seem enigmatic. mist searching for its own awakening. Is it just imagination or does that sound an awful lot like Freud’s Id, ego and super-ego mental structure? Gibran first published his work only three years after Freud introduced the notion of a tripartite division of the mind. Perhaps it is just a coincidence. What annoys me about the Prophet is his abundant hero-worship. This strikes me as quite false. I want to imagine how an encounter between Almustafa and Nietsche’s Zarathustra would go (I would pay good money for a cage battle…). For one Gibran’s philosophical hero is quite the populist. His words do not move the citizens of Orphalese to anger. In fact they merely listen passively to his monologue. Zarathustra, by comparison, was a hermit who presented people with terribly upsetting notions such as ‘god is dead’, which is not the kind of thing that inspires the devotion enjoyed by Almustafa. I am sure all of this sounds quite silly, but to my mind wisdom is something that is not only hard-won, but incredibly lonely. 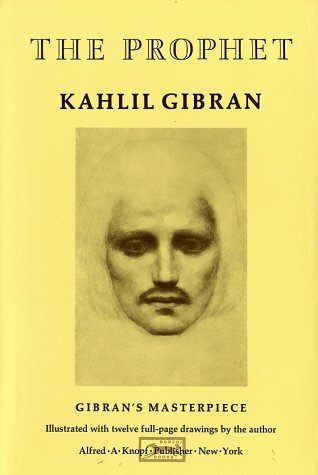 Gibran’s book encourages a curious faddishness, a naieve fantasy of philosophical wisdom, which no doubt explains its popularity during the 1960’s counter-culture. Prettily phrased, but lacking any true rhetorical heft. The passage you started your review with is my favourite one of “The Prophet” and while I agree that Gibran’s text invokes a faddish/cultish following, I am not sure I agree with you that it lacks substance. I appreciate the simplicity and absoluteness of each verse (makes me think more) and whenever I read this book (which is once about every 15 years like you 🙂 it makes me think about life in a different way. Perhaps that was the author’s only intention. I agree with you about Gibran’s use of language. It does read quite well, even still. I now think my 15-year old self responded more to the free verse, which as you say is quite thoughtful and beautifully phrased. Perhaps I should have emphasised that more in my review, but I returned to the book looking for something else I guess.